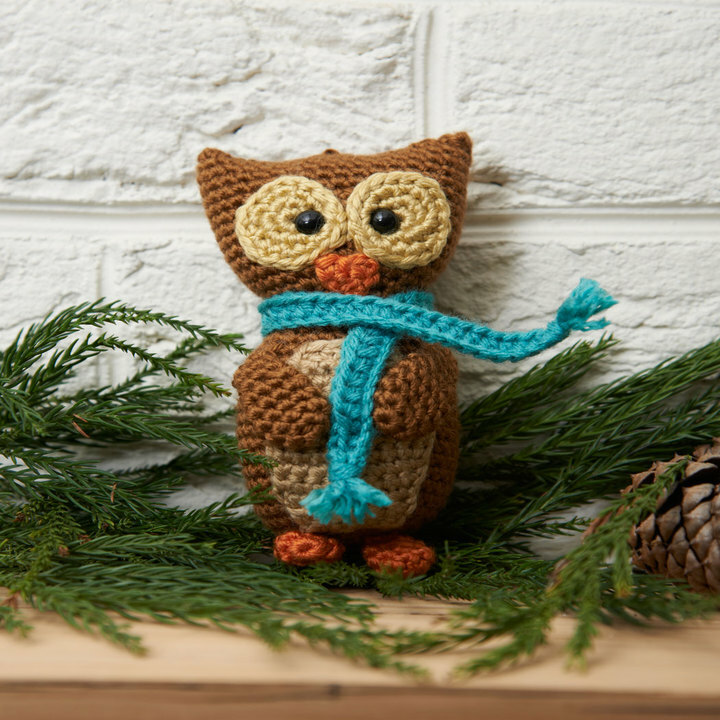 Use your crochet skills for a bit of holiday fun. 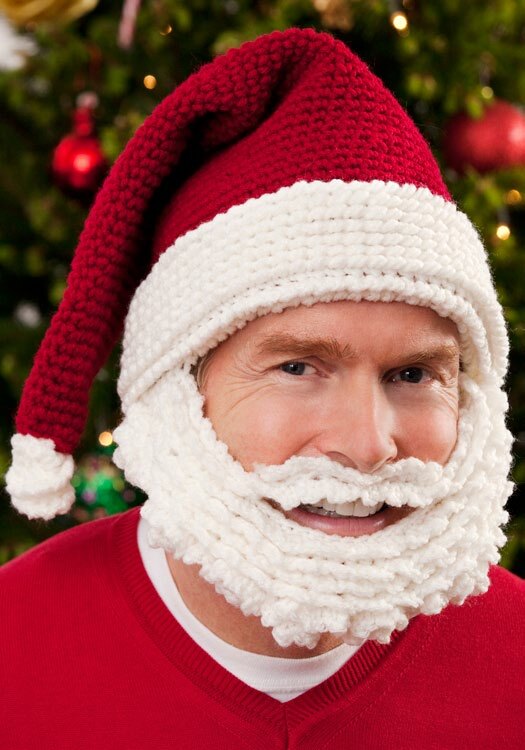 Wearing this Santa hat and beard will make anyone feel like a jolly ol’ elf! Gauge/Tension: GAUGE: 12 sts = 4″; 14 rows = 4″. CHECK YOUR GAUGE. Use any size hook to obtain the gauge. Sc2tog = [draw up a loop in next st] twice, yo and draw through all 3 loops on hook. Shell = (sc, ch 2, sc) all in next st.
ring from finger. Work stitches of first round in the ring. Pull gently, but firmly, on tail to tighten ring. With A ch 66; join with a slip st to first ch taking care that ch is not twisted. Round 1: Ch 1, sc in each ch around; do not join but work in continuous rounds – 66 sc. Place marker in last st and move up each round. Rounds 2-10: Sc in each sc around. Round 11: [Sc in next 9 sc, sc2tog] 6 times – 60 sc. Rounds 12-16: Sc in each sc around. Round 17: [Sc in next 8 sc, sc2tog] 6 times – 54 sc. Rounds 18-22: Sc in each sc around. Round 23: [Sc in next 7 sc, sc2tog] 6 times – 48 sc. Rounds 24-28: Sc in each sc around. Round 29: [Sc in next 6 sc, sc2tog] 6 times – 42 sc. Rounds 30-34: Sc in each sc around. Round 35: [Sc in next 5 sc, sc2tog] 6 times – 36 sc. Rounds 36-40: Sc in each sc around. Round 41: [Sc in next 4 sc, sc2tog] 6 times – 30 sc. Rounds 42-46: Sc in each sc around. Round 47: [Sc in next 3 sc, sc2tog] 6 times – 24 sc. Rounds 48-52: Sc in each sc around. Round 53: [Sc in next 2 sc, sc2tog] 6 times – 18 sc. Rounds 54-56: Sc in each sc around; slip st in next sc. Round 1: With wrong side facing, join B in any ch of beginning ch; ch 1, sc in each ch around; do not join but work in continuous rounds as before – 66 sc. Note: After Round one the brim will flip “up” and you’ll be working on the right side. Rounds 2-9: Sc in back loop of each sc around. At end of Round 9, slip st in back loop of next sc; do NOT fasten off. Round 10: Work Reverse Sc in each sc to marker. Note: Rounds 11-18 are worked in a spiral in the unused loops of Rounds 9-2 in descending order. Rounds 11-18: Work Reverse Sc in each free loop (the remaining front loop) around. Fasten off. Round 1: With B, make an adjustable ring, 6 sc in ring; do not join, place marker and move up each round – 6 sc. Round 2: [2 sc in back loop of next sc] 6 times – 12 sc. Round 3: Sc in back loop of each sc around. Round 4: [Sc2tog in back loops] 6 times – 6 sc. Fasten off leaving long tail. Weave yarn through remaining sc, draw up firmly, and fasten securely. Rounds 5-8: Join B with Reverse sc in last st of Round 4, working in a spiral toward the first st of Round 1, Reverse sc in each st or free loop around. Fasten off leaving long tail. Fold hat point in half to make it narrower; sew ball onto hat tip. Starting at Beard with B, ch 33. Row 1 (Right Side): Working in ridge behind ch only, sc in 2nd ch from hook and in next ch, 2 sc in next ch, [sc in next 8 ch, 2 sc in next ch] 3 times, sc in last 2 ch; turn – 36 sc. Row 2: Ch 1, working in front loops only, sc in first 2 sc, 2 sc in next sc, [sc in next 9 sc, 2 sc in next sc] 3 times, sc in last 3 sc; turn – 40 sc. Rows 3 and 5: Ch 1, sc in back loop of each sc across; turn. Rows 4 and 6: Ch 1, sc in front loop of each sc across; turn. Row 7: Ch 1, working in front loops only, * shell in next sc; repeat from * across; turn – 40 shells. Now work in free loops of descending rows. Row 8: Ch 1, working in the free loops of Row 6, shell in each free loop across; turn – 40 shells. Row 9: Ch 1, working in the free loops of Row 5, [shell in next free loop, skip 1 loop] 19 times, shell in next free loop, sc in last free loop; turn – 20 shells. Row 10: Repeat Row 9 except work in free loops of Row 4. Row 11: Repeat Row 9 except work in free loops of Row 3. 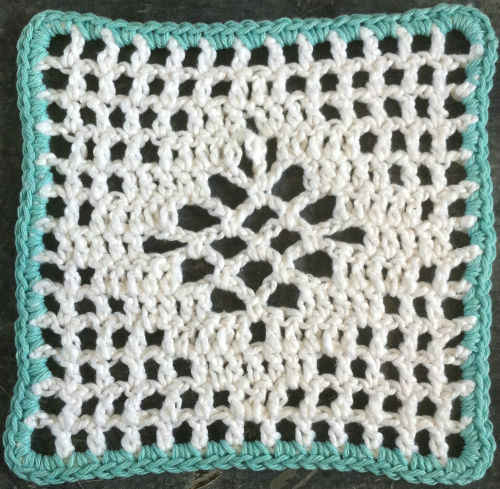 Row 12: Repeat Row 9 except work in free loops of Row 2. Mustache Row 13 (Wrong Side): Ch 1, working in the back loops only of the underside of the foundation ch, [shell, skip next ch] 5 times, ch 15, skip next 13 ch, [shell, skip next ch] 4 times, shell in last ch; turn. Row 14: Ch 1, working in remaining loops of the same foundation row and in one loop only of the ch-15, [shell, skip 1 st] 16 times, shell in last st – 17 shells. Fasten off. Row 15: Join yarn to work across the unused loops on the ch-15 only; [shell, skip 1 st] 7 times, shell in last st. Fasten off. Try the hat on and pin beard to brim to get comfortable fit.